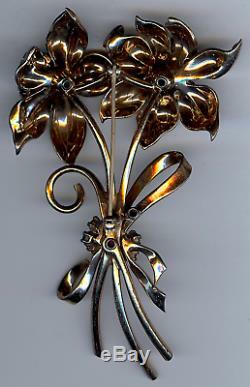 This fabulous vintage signed PENNINO STERLING gold washed dimensional rhinestone peony flowers pin measures 4 by 2-1/2. Has a secure closing roll over style clasp and is in very nice condition with slight wear to the gold wash. 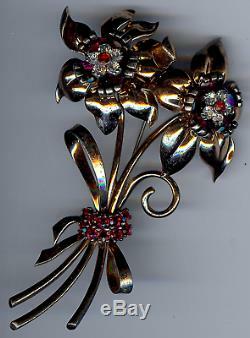 The item "PENNINO VINTAGE STERLING SILVER & RHINESTONE DIMENSIONAL PEONY FLOWER PIN BROOCH" is in sale since Tuesday, August 25, 2009. This item is in the category "Jewelry & Watches\Vintage & Antique Jewelry\Costume\Designer, Signed\Pins, Brooches". The seller is "deja--voodoo" and is located in Santa Cruz, California. This item can be shipped worldwide.